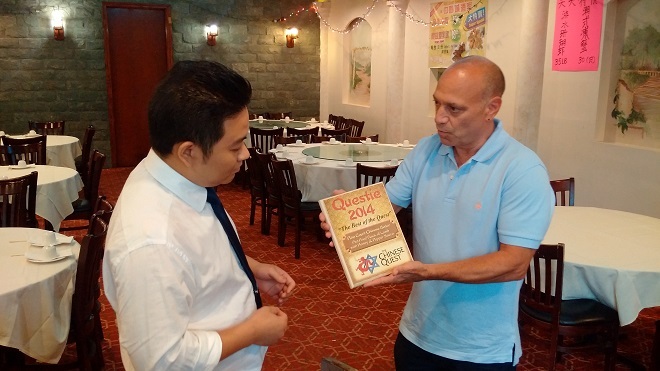 Kung Fu Xiao Long Bao, in Flushing, NY came touted to us as having THE BEST Soup Dumplings anywhere. Even better than the Soup Dumplings at Joe’s Shanghai! That’s quite a bold statement! 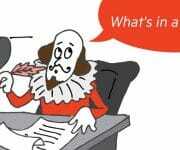 Were they? You’ll have to read on to find out if we agreed! Kung Fu Xiao Long Bao is located at the Southern part of Main Street in Flushing. 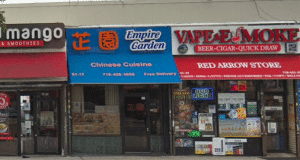 There are quite a few great Chinese restaurants right in that two block radius. 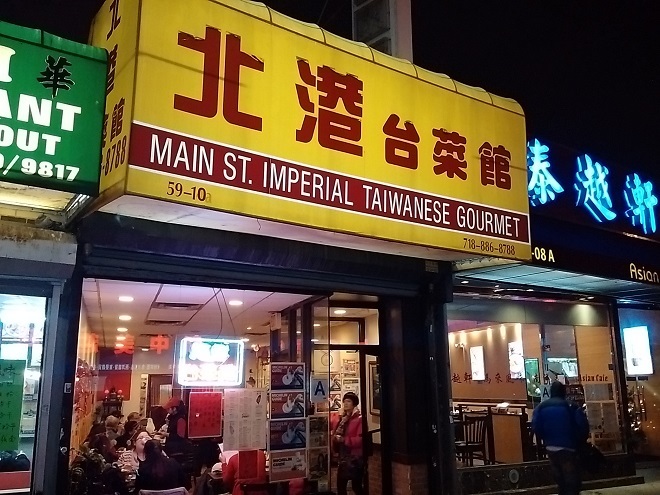 Right next door is one of our favorite, Imperial Taiwanese Gourmet. On the other side of the street a block north is Shanghai Cuisine 33; a block to the south is Lake Pavilion. 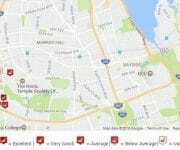 All of these restaurants are just off the Long Island Expressway. Parking is a LOT easier to find than in downtown Flushing! 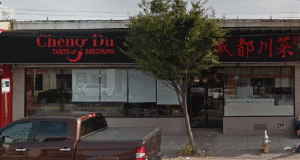 Kung Fu Xiao Long Bao is located at 59-16 Main Street, Flushing, NY 11355. 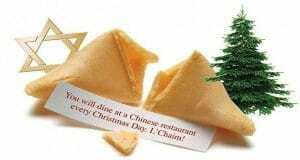 It’s sandwiched in between lots of other Chinese restaurants. What you couldn’t tell from the outside was how modern and clean the interior is! Even the bathroom! 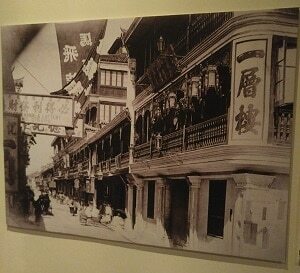 Adorning one wall are some photographs of old Shanghai juxtaposed with pictures of new, modern, Shanghai. Kung Fu (功夫) – Refers to any discipline or skill achieved through hard work and practice, not necessarily martial arts. Assuming this refers to the skill of cooking, my taste buds came alive! Kung Fu Xiao Long Bao – Skilled at making Dumplings. BINGO! 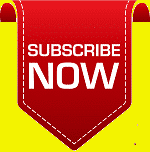 Soup Dumplings – The dumpling wrappers were thinner than any other soup dumpling wrapper we have ever had. You would think that that would make them fall apart easily. Surprisingly that wasn’t the case (no pun intended). In fact, it accentuated the flavor of the soup and pork filling. 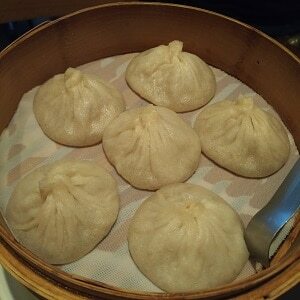 We also had an order of Soup Dumplings with Pork and Crab Meat. I preferred the Soup Dumplings with just the pork filling. 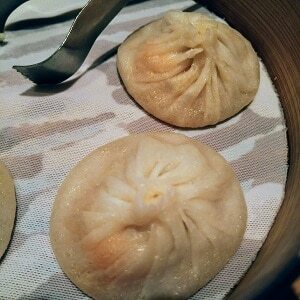 Are they better than the Soup Dumplings at Joe’s Shanghai? That is a personal choice. I will say this, they are at least on par with Joe’s, and you might just prefer the thinner wrapper. We were ready then to try more dishes on the menu. Our waiters were eager to make suggestions, and for the most part we accepted their recommendations. Stewed Ribs – Not the spareribs that you would expect at an Americanized Chinese restaurant, but these are served Wuxi style. The vegetable in the dish was Spinach. 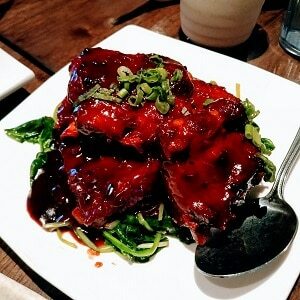 We’ve had Wuxi-style spare ribs before. 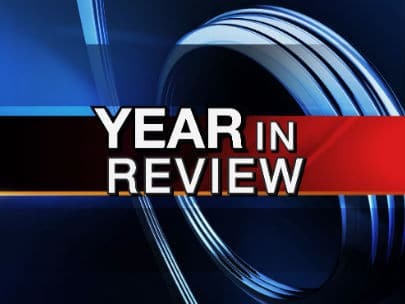 These didn’t match up to what we have had in the past. The sauce was sort of sweet you like you find on Americanized BBQ Spareribs, but not exactly. Mee V. Stoogas really thought I would love these. In my opinion, this dish just missed. 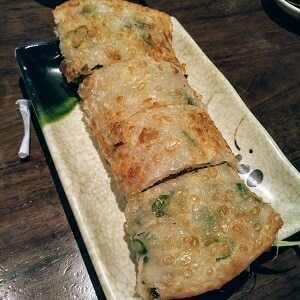 Scallion Pancakes with Beef – For as far as the Stewed Ribs missed, this dish hit it out of the ballpark! A Questie-worthy dish I proclaimed. This was just fantastic inside and out. The outer wrapper, the pancake, was crispy and delicious. 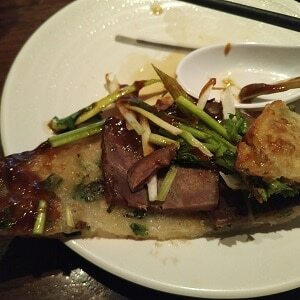 The inside was filled with beef, hoisin sauce, and scallions… almost like Peking Duck! I would have this dish every time I went. You must try it! String Beans with Eggplant – It is well documented how much we love Chinese vegetables, and how much I don’t like eggplant (at least until I had them at a few of the last Chinese restaurants we had been to). I guess you could call this a 50/50 dish in my eyes. 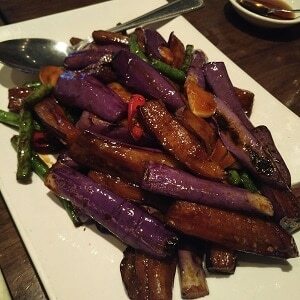 The eggplant lived up to my prior experience, and String Beans weren’t crispy nor crunchy (neither was the eggplant). For one of the rare times on this Quest, I was disappointed in the vegetables. Fish Filet with Soy Sauce – The fish was flounder, the soy sauce was very lightly applied. 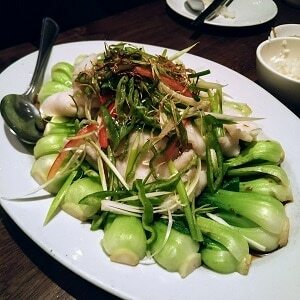 This dish was served with Bok Choy. Seeing this dish being served at practically every other table, we figured that this was a must try dish. To me the fish was very dry and lacked much flavor at all, probably because of the limited amount of soy sauce it was cooked in. The Bok Choy was ok. Being that only four of us made it this evening (we missed you Mee Gonzi Biao) we had enough food to fill us. We were very happy to see the bill was about $80. Not bad for four hungry people. 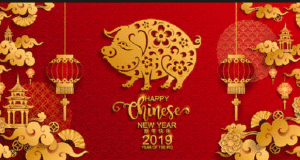 To sum up Kung Fu Xiao Long Bao, I would definitely come back for the Soup Dumplings, and the Scallion Pancakes with Beef, and I might try another dish or two. 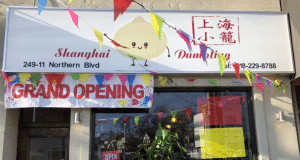 Where are the best Soup Dumplings you ever had? Please post your comments below. 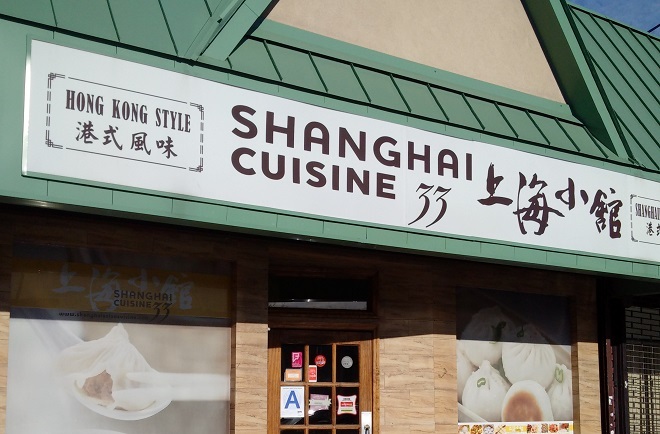 Kung Fu Xiao Long Bao, a Shanghainese Chinese Restaurant located in Flushing, NY came touted to us as having THE BEST Soup Dumplings. Even better than the Soup Dumplings at Joe’s Shanghai. That’s quite a bold statement! Were they? You’ll have to read on to find out if we agreed! Who makes the best Soup Dumplings?